A fourth Camino finished.Camino marker. You took your first step in Saint-Jean-Pied-de-Port. You crossed the Pyrenees Mountains and the Castilian meseta. You left a piece of your past at Cruz do Ferro. Perhaps you started in Irún and walked along the Cantabrian coast before cutting inland to climb the Asturian mountains. 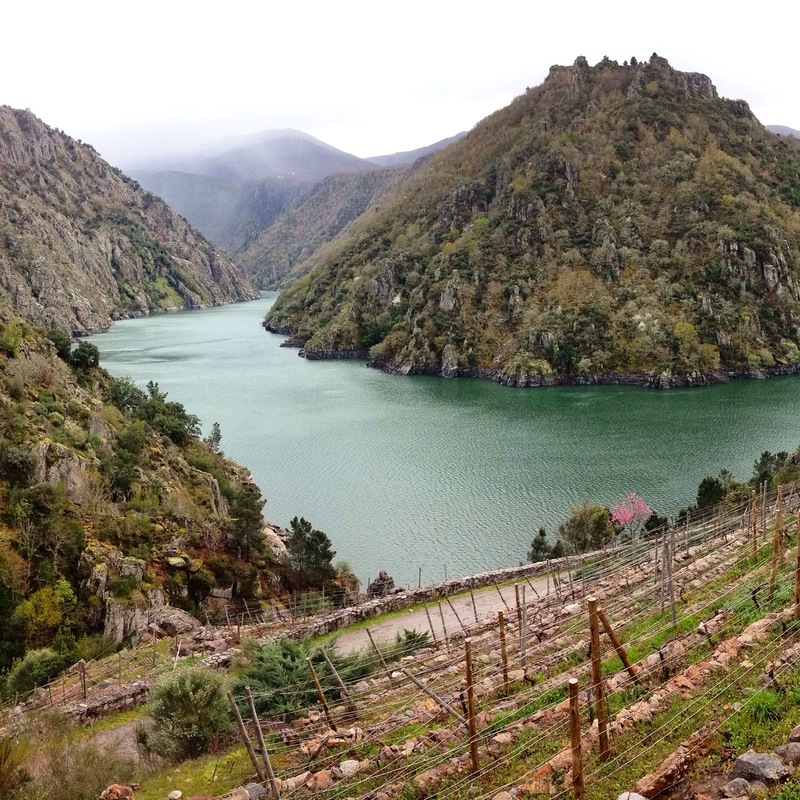 Maybe you began at the cathedral in Porto, crossed the Miño, and walked through albariño vineyards. Whichever Camino you walked, it has brought you to Santiago de Compostela, where you have embraced Saint James and received your Compostela from the Pilgrim’s Office. Now, you find yourself standing in Obradoiro Square wondering where to next. Back to Madrid to catch your return flight? Busy Barcelona? Instead, stay in Galicia and take advantage of the region’s world-class cuisine, pristine beaches, or any of the following options. Many pilgrims–but by no means a majority–do not consider their pilgrimage finished when they arrive in Santiago. Rather, they continue westward to Fisterra, where the final Camino marker reads zero at the lighthouse at “the end of the world.” The Romans thought this was where the earth stopped and the sight of the sun disappearing into the Atlantic terrified them. Nowadays, pilgrims hike to this point to burn an article of clothing, boots, letters, or anything else they carried with them on their Camino. The ritual is deeply important to pilgrims and the non-pilgrim visitors are very respectful–the Atlantic wind is the only thing that breaks the solemn silence. The hike from Santiago to Fisterra takes a minimum of three days, with the final two stages over thirty kilometers each. It is possible to break the hike into four days if you prefer shorter days. There are several albergues in the town, including one where pilgrims can obtain a certificate stating they have completed the trek to Fisterra. If you stay overnight or have time for lunch, the restaurant Tira do Courel is highly recommended. Virxe da Barca sanctuary in Muxía. Hiking to Muxía adds another day but it is worth the effort. It was here, according to legend, that the Virgin Mary appeared to Saint James to encourage him to continue his attempts to convert the local populace to Christianity. The magnificent stone church La Virgen de la Barca–its roof recently repaired after a lightning strike–stands precipitously close to the rocky coast; sometimes the waves flood the church during the winter storms. Huge boulders, strewn about in front of the church, take on the shape of various parts of the stone boat that Mary arrived in according to the legend. A constant stream of visitors crawl nine times under the Pedra dos Cadrís–the “sail” of Mary’s boat–hoping to cure kidney diseases or back pain. Those that can make the Pedra de Abalar shake will be free of sin. Regardless if you believe the legends or not, Muxía is a dramatic setting to contemplate the end of your pilgrimage. If you have time, visit nearby Camariñas, famous for its lace work, and the impressive lighthouse at Cabo Vilán. Regardless if you began in France or Galicia, your body is tired and sore. The mere thought of another day hiking makes your knees ache. If this is true, then hop on a Renfe train and make the thirty-minute journey south to Ourense. This provincial town is famous for its geothermal waters, some of the most extensive in Europe. There are numerous hot springs–some free while others charge a small entrance fee–along the Miño River. There is also a free public bath on the site of the original Roman baths–As Burgas–in the center of the city. Nearby is Ourense’s main plaza, where you can catch the tourist tram that stops at the various hot springs along the river. The tram’s final stop is near the best facilities, the private Termas de Outariz. The entrance fee is a reasonable €5.15, allowing you to relax for two hours in several pools of varying temperatures, from very hot to ice cold. You need a towel, bathing suit, and flip-flops. There are free public baths nearby with decent facilities but the serenity available at the private facility is worth to price of entrance, especially if you have sore feet from the Camino. Rodas Beach on Cíes Islands. After weeks on the Camino, a return to city life might be a shock. If that is the case and you want to ease back to civilization, head to Cíes Islands, an archipelago at the mouth of the Ría de Vigo. Santiago is now well connected via a high-speed train to Vigo, the industrial engine of Galicia. From Vigo, take a forty-five minute ferry to the Cíes Islands, an oasis free of cars and commercialization. You can make it a day trip or plan head and camp on the island at the regulated campsite. There are numerous hiking paths and the scenery is breathtaking–it is my favorite natural park in Galicia–but the top draw is Rodas Beach. It is a long stretch of white sand and calm, crystal clear waters as it faces the Ría de Vigo instead of the rough Atlantic. The water is cold even in August but after the initial shock it is a refreshing way to heal weary pilgrim bones. 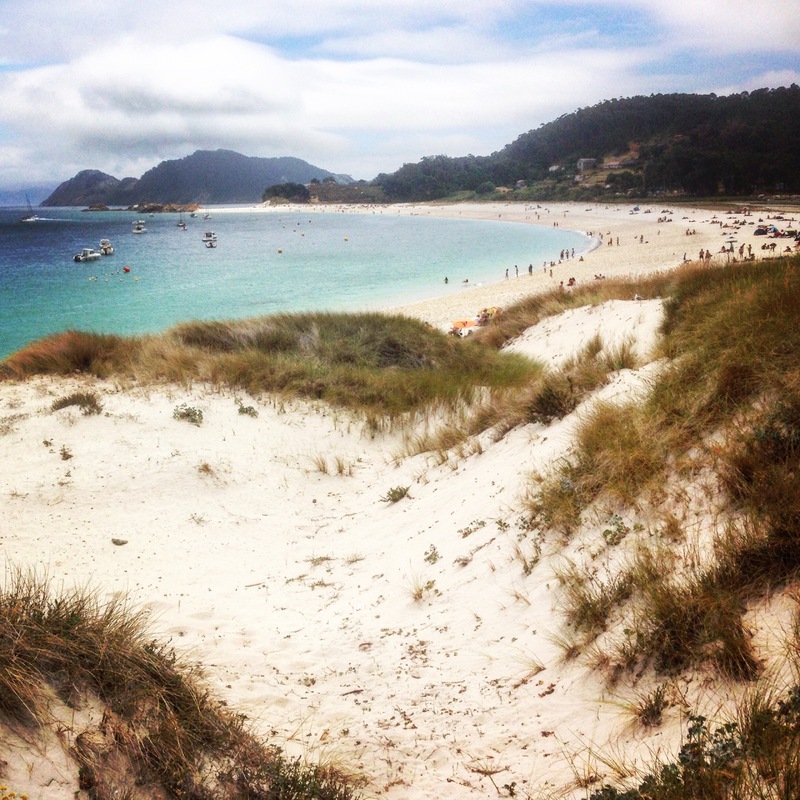 The Cíes Islands has Galicia’s best beach but the Rías Baixas region where the islands are has countless more beaches, quaint villages, and world-renowned albariño wines. The Rías Baixas albariño is perhaps the most popular white wine in Spain. You can celebrate your completed Camino by visiting small bodegas or touring large wine producers like Martín Codax. Sanxenxo is a posh summer resort while low-key Cambados is the de facto capital of the Rías Baixas wine region. Combarro is one of Galicia’s most beautiful villages and the provincial capital Pontevedra is an important stop on the Camino Portugués. If wine is your thing but you refer reds over whites, then your post-Camino destination should be the Ribeira Sacra region near Ourense. The region takes its name–literally “Sacred Shore”–from the network of monasteries throughout the Sil Canyon. The region has one of the highest concentrations of Romanesque architecture in Europe. There are vertigo-inducing vineyards clinging to the steep canyon walls, coining the term “heroic vine-growing” as the grapes can only be harvested by hand due to the terrain. The main wine produced here comes from the mencía grape, an underrated Spanish red wine that pairs excellently with a plate of Galician-style octopus. In fact, the best pulpeiros–octopus cooks–come from the Ourense area. Ourense also produces the best empanadas and licor café in Galicia, making Ourense and the Ribeira Sacra a great place to visit to gain back the weight you lost while walking the Camino. Some are spicy, others aren’t. 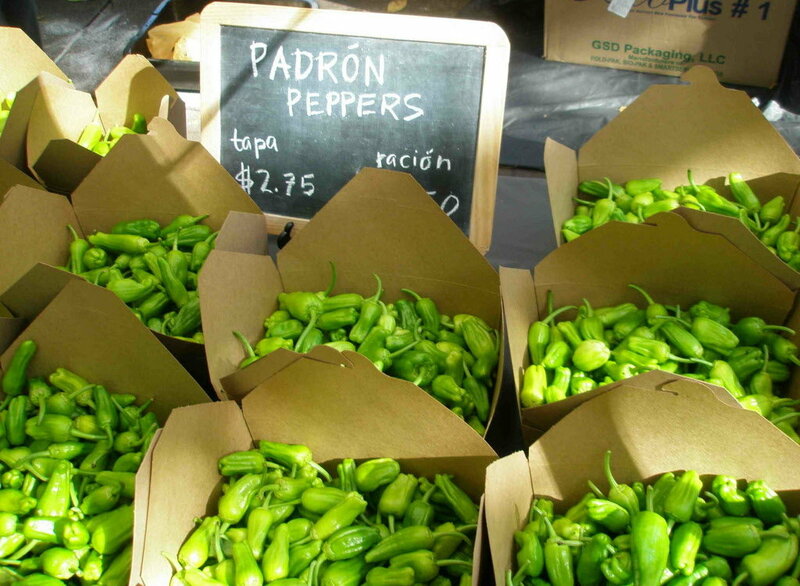 It is impossible that a pilgrim completes the Camino de Santiago without having tried the famous Padrón peppers. These little green delicacies are a highlight of Galicia’s incredible gastronomy. If you fell in love with the peppers like so many other pilgrims, then you can visit their namesake in the town of Padrón, a short bus ride from Santiago. The peppers were originally brought to Galicia from Mexico by priests. In fact, their true name is Hebrón peppers, taking their name from the monastery near Padrón where they were first cultivated in the Old World. Padrón also happens to be near Iria Flavia where Saint James first preached and his remains were brought after being martyred in Jerusalem. The post that James’ disciples supposedly moored their boat to when they brought the apostle’s remains back to Spain is underneath the altar in Padrón’s church. Padrón is linked to another of Galicia’s most important figures, Rosalía de Castro. Galicia’s national poet lived her last years in the town and her house has been converted in a museum. 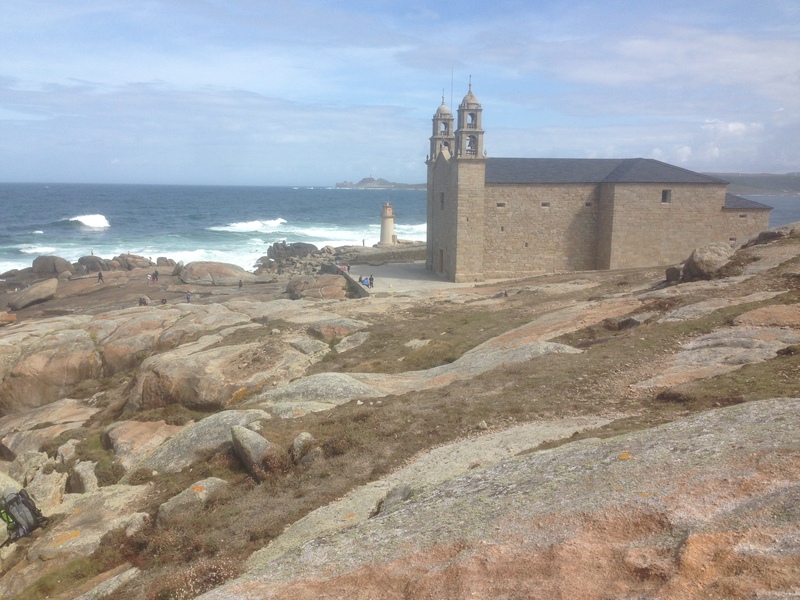 Amongst the Galician people there is the legend that if one does not visit San Andrés de Teixido during their life then they will visit it after they have died. If you are not afraid of ghosts–or do not believe in them–and do not wish to return to San Andrés de Teixido as a ghost, then make the pilgrimage to this tiny village that hugs the dramatic coast north of Santiago. These cliffs are second steepest in all of Europe–beaten only by Norway–and are an excellent place to watch the sunset. Nearby is Cedeira, a fishing village noted for the percebeiros, fishermen who risk their lives scrapping expensive goose barnacles from the rocky coastline. The lighthouse at Cabo Ortegal is at the point where the Atlantic Ocean meets the Cantabrian Sea. Can’t shake the hiking bug? Then keep scratching that itch on the Way of the Lighthouses, a 200-kilometer route along the Coast of Death. A group of outdoor enthusiasts, calling themselves Trasnos, created this Camiño using existing trails and roads that link Fisterra with Malpica. Their website breaks the hike into eight stages and has a plethora of information, including accommodation options. The route “runs through loads of different landscapes, always looking at the sea towards the west. Lighthouses, beaches, dunes, rivers, cliffs, forests, estuaries with a great variety of birds, “castros” (hill-forts), dolmens, fishing villages, viewpoints from where to enjoy how the sea breaks in all ways possible.” The Trasnos recently used technology from Google to survey the route; the 360-degree images will be available on Google Maps in March. This post has such great info and ideas, thank you! 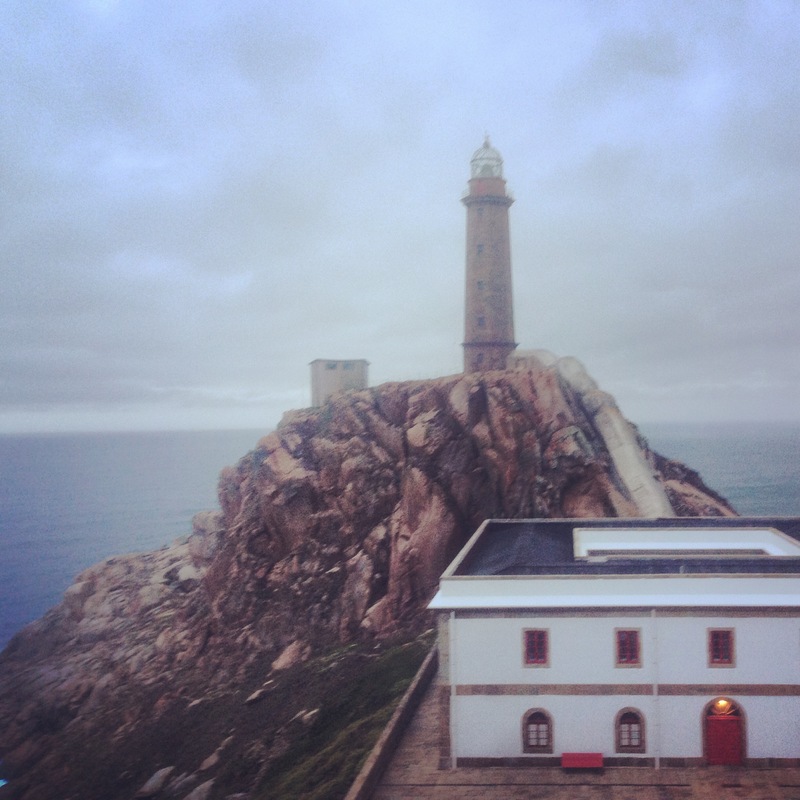 I had a few days to spare after my Camino (and after walking to Finisterre), so I took a little trip to the Cies Islands. They were so incredible, beautiful and peaceful… just what I needed after a really long walk. Really enjoyed your post Seth! It brought back so many good memories from almost 5 years ago; I would love to return to Galicia and visit many of the places you wrote about.